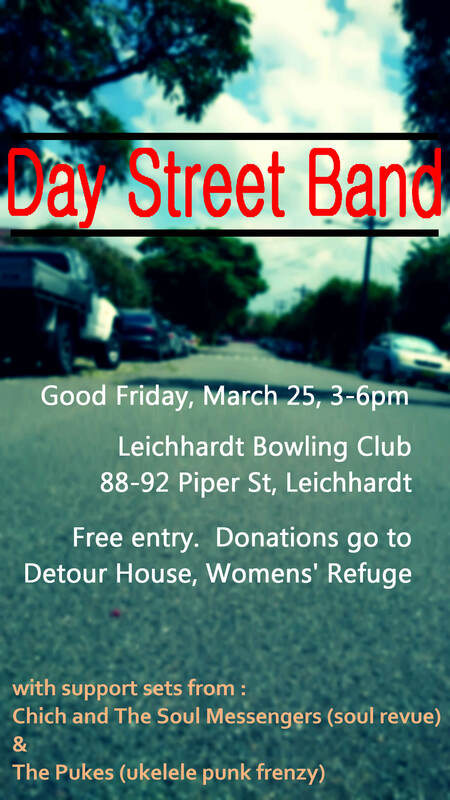 Day Street Band is a community band, set up to raise money for Detour House Inc, a young women’s refuge based in Leichhardt. Our members all live on Day Street, Leichhardt. Since 2016 we have raised over $18,000 for the charity. Our next show is from 1-5pm on June 10, 2019 at Leichhardt Bowlo, 88-92 Piper Street, Leichhardt. As always we will be raising money for Detour House, a womens’ refuge. Kids are welcome! Free entry. We originally set up for fun, but realised we could have fun and help our community through the power of music! Previous gigs have included tunes from The Beatles and Pink Floyd, but also Neil Diamond and Counting Crows, then all the way to The Ramones, Screaming Jets and Radio Birdman. Just like the members of the band, our song choices are eclectic. Detour House is a non-profit organisation servicing homeless and other at-risk girls and women, based in Sydney, Australia. Detour House also incorporates The Girls Refuge, a crisis accommodation service for homeless girls. Donate Now to the 2019 Fund-Raiser! 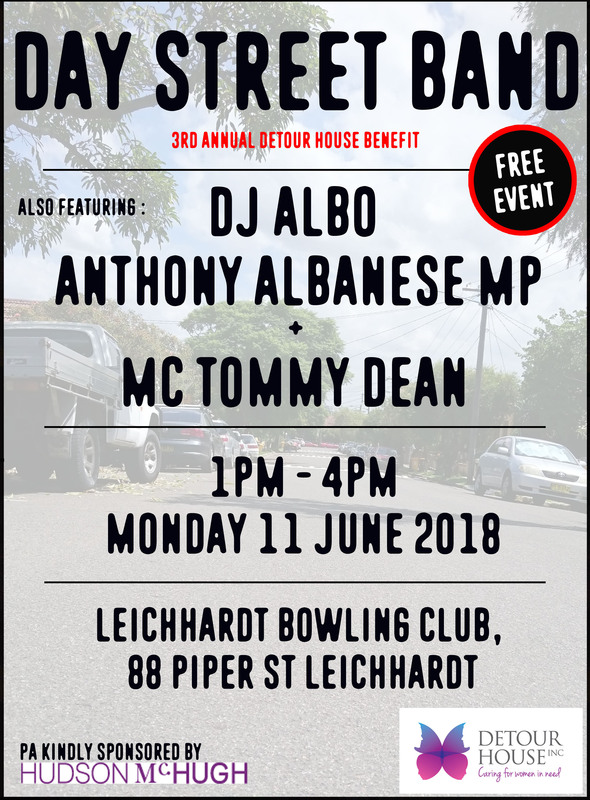 For the third year in a row, a group of neighbours from Day Street in Leichhardt are taking to the stage to raise much needed money for an inner west women’s refuge, but this year federal politician Anthony Albanese MP will join them in a role as DJ Albo. 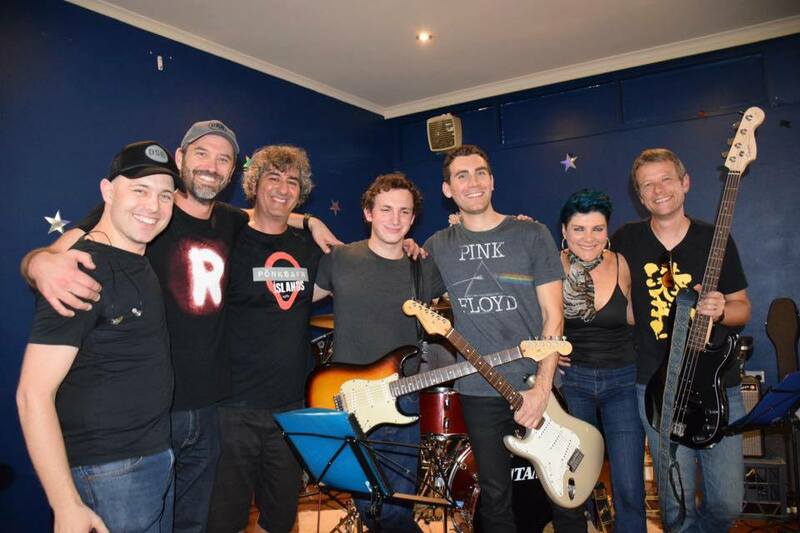 In a benefit that promises to be the biggest to date, the Day Street Band family friendly event will be held at 1pm at Leichhardt Bowling Club on Queen’s Birthday holiday Monday, June 11. ABC regular Comedian Tommy Dean will join the event as MC and in a true community effort, local business Hudson McHugh have also jumped on board, sponsoring the event with a generous contribution towards staging costs. All proceeds from the event will go to Leichhardt and Glebe-based women’s shelter Detour House Inc. The Day Street Band was formed at the street’s annual Christmas party in December 2015. Monthly BBQs and a FaceBook group keep this bunch of neighbours well connected with each other. The group boasts two professional musicians, but in keeping with the ethos of the Day Street Band, neither session singer Amanda Easton nor guitarist Simon Morel will be taking their usual places on stage. The band also features Day Streeters who played semi-professionally ‘back in the day’ – from 90s alt-rock bands to 70s punk bands – playing a range of party tunes from the 60s, 70s, 80s and 90s. Over the last two years, the Day Street Band benefits have raised over $7,000 for Detour House. Previous shows have had bowlo-busting 400 plus crowds. The event is all ages and free to attend. Donations have come from the crowd on the afternoon, internet campaigns, Leichhardt Bowling Club and Restaurant and of course sales from the must have inner westie fashion item, the Day Street Band baseball cap. This year there will be new limited edition Day Street Band merchandise for sale, with all proceeds going to Detour House. Detour House was established in 1984 and provides a 15 month rehabilitation program to women recovering from drug and/or alcohol dependency and complex problems in their lives. Simon Morel is a Leichhardt-based musician. He has released 2 solo albums. He currently plays guitar in and manages Sydney Soul band, Soul Messengers (www.soulmessengers.com.au) and works as a guitar player for inner west chanteuse Amanda Easton (www.amandaeaston.com). In addition, he works as a session guitarist, offers private and group guitar lessons and offers free advice and music industry contacts to music artists via his company The Record Factory. He also authors two music blogs: SimonLovesGuitars and The Record Factory. Anthony Albanese is an Australian politician who has been a member of the House of Representatives since 1996, representing the Labor Party. He was a minister in the Rudd and Gillard Governments, including as Deputy Prime Minister. Tommy Dean is a professional comic, raised in Arizona, who has called Sydney home for the past 21 years. Known for his distinct Rock God look and booming voice, he has worked with luminaries such as Tim Alan and Rosie O’Donnell in the USA, and all of Australia’s leading acts. He has been a regular headline act in comedy venues in Australia and throughout the USA and appeared in the Melbourne International Comedy Festival and other major comedy festivals throughout Australia and New Zealand. His Australian CV includes Spicks and Specks, Good News Week, Stand Up Australia, Rove Live, Joker Poker and The Sideshow. 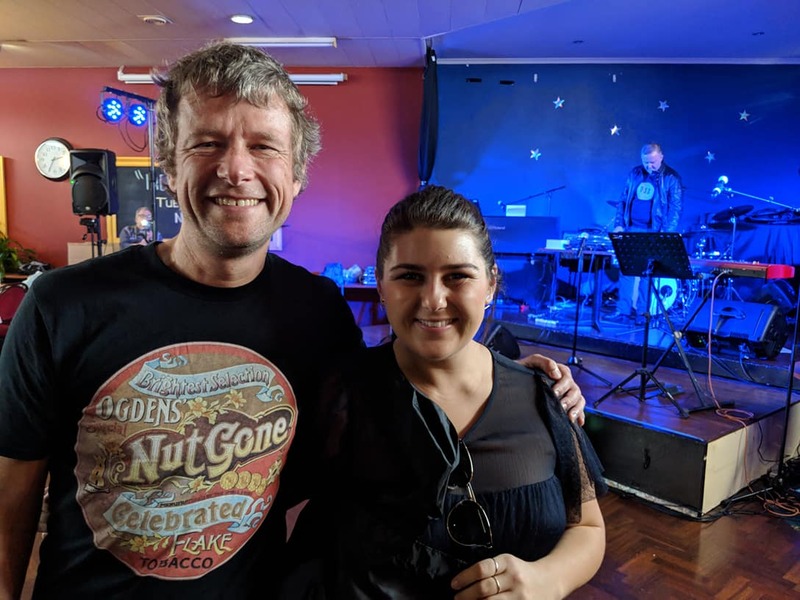 For the second year running, a group of neighbours from Leichhardt’s Day Street have banded together with the support of the Leichhardt Bowlo, for an afternoon of music, community vibes and fund raising. The event at the Bowlo on Sunday, March 26 from 3 to 6 pm, will aid Leichhardt and Glebe-based womens’ shelter Detour House Inc. The 2016 show was a resounding success, with a bowlo busting 400 plus crowd and over $3,000 raised for the inner west charity. 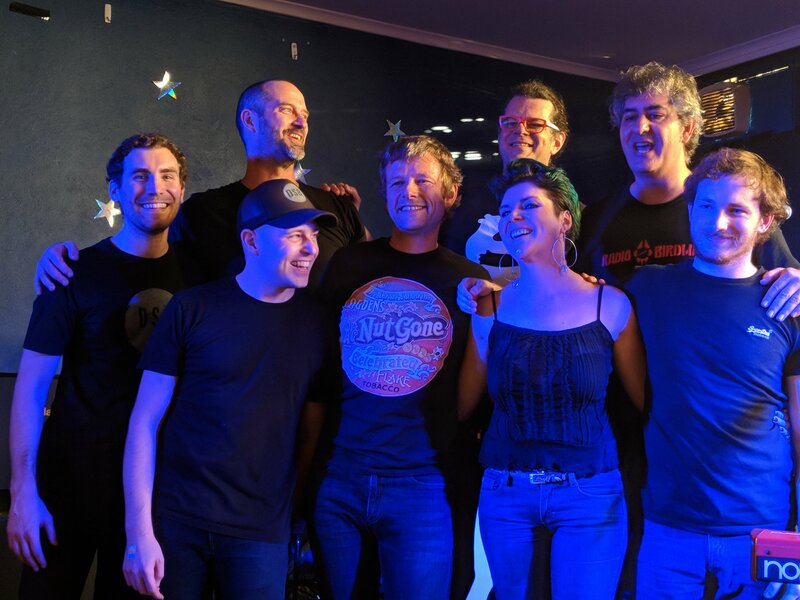 The donations came from the crowd on the night, an internet campaign, Leichhardt Bowling Club and Restaurant, Soul Messengers merchandise sales and the fashion item of 2016, the Day Street Band baseball cap. The aim this year is to beat both those numbers with a donations target of $4,000. Plus, there will be a new limited edition Day Street Band cap. The Day Street Band was formed at the street’s annual Christmas Party in December 2015. Monthly BBQs and a FaceBook group keep this bunch of neighbours well connected with each other. The group boasts two professional musicians, but in keeping with the ethos of the Day Street Band, neither session singer Amanda Easton nor guitar teacher Simon Morel will be taking their usual places on stage. The band also features Day Streeters who played semi-professionally ‘back in the day’ – from 90s alt-rock bands to 70s punk bands – playing a range of covers from the 60s, 70s, 80s and 90s. In addition to the Day Street Band, critically acclaimed Leichhardt-based bluesy soul band Soul Messengers and electro pop chanteuse Amanda Easton will be playing short sets.